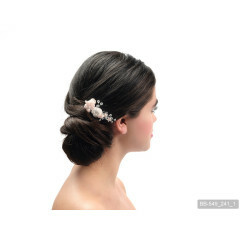 Jupon stock a wide range of hair jewellery, clips combs and more featuring high quality crystals and pearls. Click any of our products below for more information. 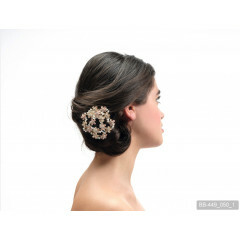 A smaller sized hair clip from Jupon with a single flower design and finished off perfectly with Strass stones and glass crystals. Available in Ivory / Peach. 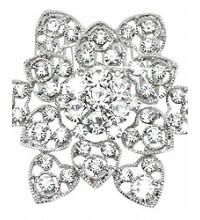 ..
A stunning hair clip from Jupon, featuring shimmering strass stones on a floral design. 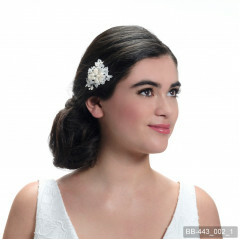 A stand out bridal hair accessory. Available in Sliver and Rose. ..
Jupon presents this gorgeous bridal hair clip that features a floral design and is finished off with stunning Strass stones. Available in Sliver and Rose. ..
A stunning Jupon hair clip featuring a large lace netting design, splashed with Strass stones. Available in Ivory. ..
A smaller sized hair clip from Jupon with an array of flowers as the main design, and it's finished off wonderfully with Strass stones and pearls. Available in Ivory / Peach. 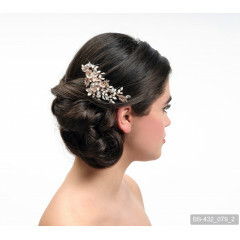 ..
Jupon presents this stunning bridal piece of hair jewellery. It features a medium sized floral pattern and is splashed with shimmering Strass stones. A very standout bridal headpiece. Available in Sliver, Gold, Rose..
A wonderful long length piece of hair jewellery from Jupon. 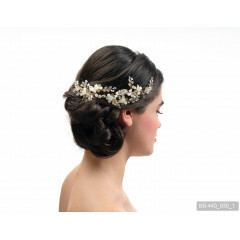 This bridal headpiece features a waving line of flowers, dashed with pearls and Strass stones. Available in Sliver, Gold, Rose. 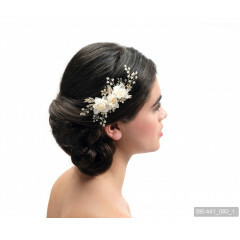 ..
Jupon brings you this floral style bridal piece of hair jewellery adorned with pearls and glass crystals. Available in Gold. ..
A colourful piece of hair jewellery from Jupon. This features a floral design with multicolour pearls and Strass stones. Available in Gold. ..
A colourful piece of hair jewellery from Jupon. 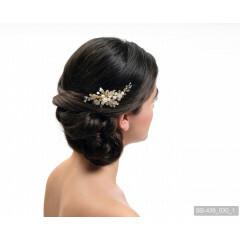 This item is attached by a clip and sits comfortably on the brides hair and is finished off perfectly with colourful sequins. Available in Gold. ..
Jupon presents this piece of hair jewellery with a triple flower design, finished off with clusters of Strass stones and pearls. Available in Peach. ..
Jupon brings you this charming floral hair clip with a 5 flower centrepiece and finished off with glass crystals and Strass stones. Available in Gold. ..
A beautiful piece of hair jewellery from Jupon. 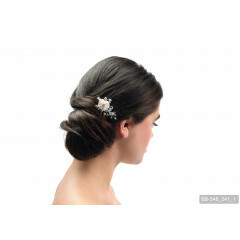 This bridal piece is attached with a clip for extra comfort and has a wonderful lace finish. Available in Ivory. ..
A stylish and intricate piece of hair jewellery from Jupon. 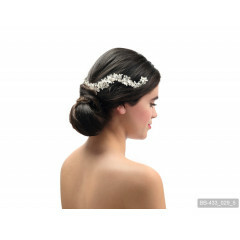 This item is attached to a clip for extra comfort and will really enhance the brides hair on her special day. Available in Gold and Silver. 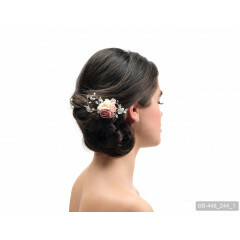 ..
Jupon brings you this stunning piece of hair jewellery. It comes in a circular design and is splashed with multicolour roses, pearls, and Strass stones. Available in Silver / Rosa. 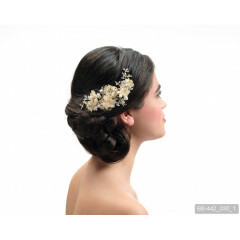 ..
A floral centrepiece really stands out on this piece of hair jewellery from Jupon. The floral design is finished off wonderfully with glass crystals and Strass stones. Available in Silver / Rosa. .. This Jupon piece of hair jewellery features a stunning floral design in a circular pattern, and finished off with Strass stones in the centre of the flowers. Available in Pink. ..
A stunning piece of hair jewellery from Jupon. This piece features both small and medium sized flowers with pearls and Strass stones as the centre. Available in Pink / Gold. ..